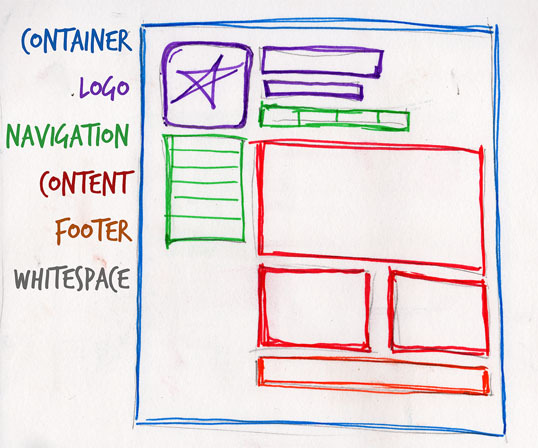 Every web page has a container. This could be in the form of the pageâ€™s body tag, an all-containing div tag. Without some sort of container, weâ€™d have no place to put the contents of our page. The elements would drift beyond the bounds of our browser window and off into empty space. The width of this container can be fluid, meaning that it expands to fill the width of browser window; or fixed, so that the content is the same width no matter what size the window is. When designers refer to an identity, theyâ€™re referring to the logo and colors that exist across a companyâ€™s various forms of marketing, such as business cards, letterhead, brochures, and so on. The identity block that appears on the website should contain the companyâ€™s logo or name, and sit at the top of each page of the website. The identity block increases brand recognition while informing users that the pages theyâ€™re viewing are part of a single site. Note: Many people use the words â€œidentityâ€� and â€œbrandingâ€� interchangeably. Branding is a broad term that describes the process of developing an awareness of a company, product, or service. The branding process involves advertising, market research, customer feedback, and much more. Identity is actually a subset of branding in that it deals only with the visual aspects of branding. The fold, as many designers call it, is where the content of a page ends before users scroll down. This metaphor is derived from the fold in a newspaper. If you look at the cover of a folded newspaper, most of the headlines and biggest news appear in the top half, so that the most important news items can be seen at a glance when the newspaper is folded. The location of the fold on a web page depends on the browser dimensions and the userâ€™s screen resolution. At a resolution of 1024Ã—768 pixels, accounting for browser chromeâ€”that is, the space taken up by the browser application itself in the form of tabs, buttons, the address bar, and a bottom status barâ€”the fold is usually just over 500 pixels from the top. Content is king. A typical website visitor will enter and leave a website in a matter of seconds. If visitors are unable to find what theyâ€™re looking for, theyâ€™ll undoubtedly close the browser or move on to another site. Itâ€™s important to keep the main content block as the focal point of a design, so that visitors can scan the page for the information they need. Located at the bottom of the page, the footer usually contains copyright, contact, and legal information, as well as a few links to the main sections of the site. By separating the end content from the bottom of the browser window, the footer should indicate to users that theyâ€™re at the bottom of the page. The graphic design term whitespace (or negative space) literally refers to any area of a page without type or illustrations. While many novice web designers (and most clients) feel a need to fill every inch of a web page with photos, text, tables, and data, empty space on a page is every bit as important as having content. Without carefully planned whitespace, a design will feel closed in, like a crowded room. Whitespace helps a design to breathe by guiding the userâ€™s eye around a page, but also helps to create balance and unityâ€”two important concepts that weâ€™ll discuss in more detail later in this chapter. At this point, weâ€™ve had our initial meeting with Mr. Smith, our theoretical client, and it was helpful. He explained very thoroughly what his business does and what he wants the site to achieve. Even though weâ€™ve yet to see actual content, we can use the standard blocks of web page anatomy to start developing a layout. Although other site-specific blocks are worked into the designs of many website layouts, the web page anatomy works to summarize the most common blocks. Now that we have this information, how can we use it to create a foundational layout for Smithâ€™s Services? Itâ€™s time for some grid theory, which weâ€™ll cover next, so stay tuned. This article is from Jason Beaird’s The Principles of Beautiful Web Design book (the second edition of which is out now). This is the third part of the first chapter.